Avid readers are probably aware that several months ago I "discovered" an aging Lustron home in Bartlessville. I came across some other photos from that trip and thought I'd share them. As always, click the image to view it larger. 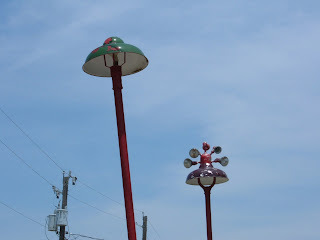 This is a weird grouping of lights at an old gas station. I happened to notice them because they're right across the street from the aforementioned Lustron! This sign caught my eye mostly because of the interesting flying vee shape and random pattern created by the holes. The glory days of the Commanche Center may be long gone- but the sign lives on. Tre mondo! That's it for this time. Hope you weren't expecting a manifest! 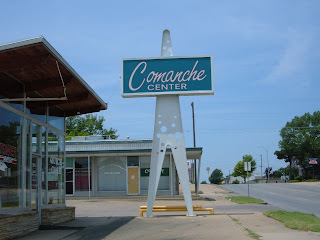 oh yeah that comanche center is one swell sign. i wonder is mr. limey's (politically incorrect) fish & chips there? ?